Justin Adian’s work might be described as liminal. Consisting of variously hued canvases wrapped around foam shapes, it tends to straddle painting and sculpture, 2-D and 3-D, softness and structure. In hints of glossiness, they also recall Richard Prince’s late-1980s car hoods, especially in how the inanimate objects seem to possess their own characters. However stuffy or tacky or otherwise fl awed, they’re in on the joke (and it’s mostly on the jerks who use words like liminal). Adian, 40, got something of a late start, which could account for the confidence on display in his work—his voice has been honed to a fi ne point, sharp enough that it doesn’t care whether or not anyone’s paying attention. 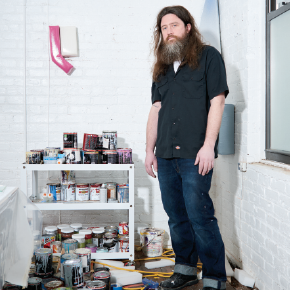 He didn’t get a New York solo show until 2010—a full decade after finishing his undergraduate degree at University of North Texas; he received his MFA from Rutgers University in 2003. He was toiling over “big, abstract” paintings, he explains, until, at a David Zwirner show in 2007, inspiration struck in the form of a foam artwork by John Chamberlain. Walking back to his Chinatown studio, he found a big piece of foam on the street and dragged it off with him. And that is how they feel: welcoming (thanks in part to the sheen of the boat paint he uses), but complicated, like the best people. They tend to beckon you in through their arrangements. Appealing to sensibilities high and low, they could be common ground for someone who is interested in questions of form and space raised by Donald Judd and someone else who likes Saturday morning cartoons. There are ones that resemble an inflated Piet Mondrian—see “Orange Crush” (2015)—and ones that look like pool noodles, as in “Wayfaring” (2015). The five pieces that will be on view in Dallas, all made in 2016, are fairly representative of his work from the past several years. Each one seems purely abstract— that is, until it’s linked with its title. A lopsided assemblage of three quadrilaterals in egg-yolk yellow, off-white, and cyan, transforms with its name, “Coral Gables,” into a sun-kissed Miami coastline. Others are more obvious, like “Lucky Jack’s,” in the matte green of a billiard table.